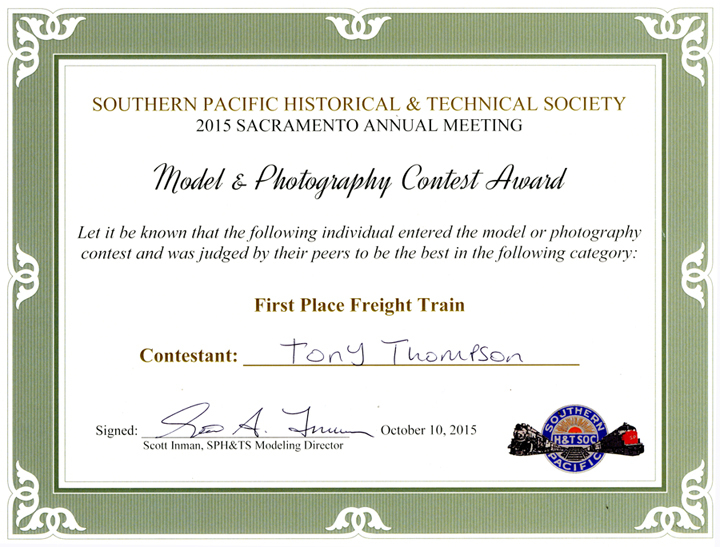 In my prior post about the 35th annual meeting of the Southern Pacific Historical & Technical Society (which you can find at the following link: http://modelingthesp.blogspot.com/2015/10/sph-meet-2015.html ), I showed an overall view of the freight train I entered in the contest. I mentioned in the post just cited that I had been asked to show the entire train, with information about its makeup, in a future blog post, and this is that post. 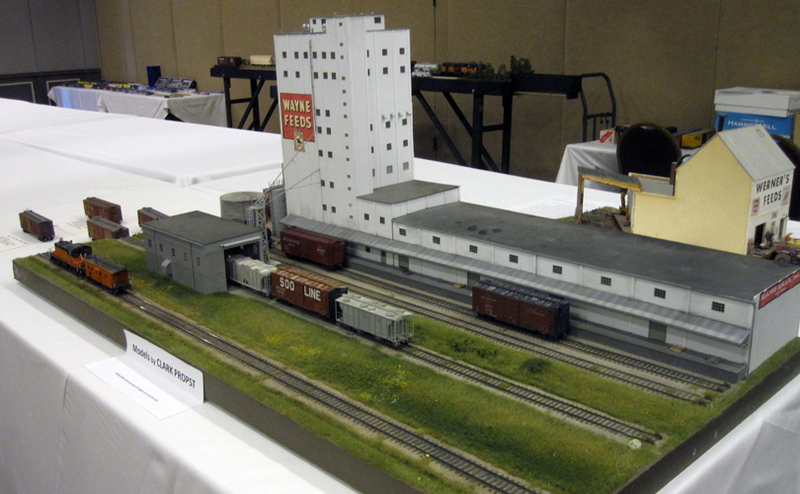 My train was entered in the freight train category, and it won first place, by vote of attendees. Below, I show the certificate awarded, which is only included here because I thought the convention committee had chosen uncommonly attractive certificates, compared to some I have seen. Before showing the train, I should mention that I deliberately chose a wide range of models for display, from Athearn “Blue Box” origins, to the latest ready-to-run (RTR) cars, and included a full range of car types (perhaps a little artificially for a single train). I will begin with the locomotive, SP 2763. It has been painted and upgraded, adding a number of detail parts, including cab window shades, crew, and cab curtains made from facial issue, and then lettered, and weathered. 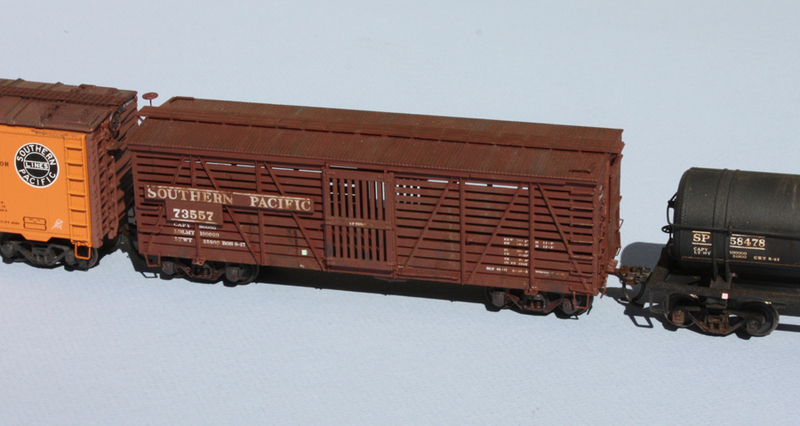 The first car in the train was a reefer with steel roof but wood-sheathed sides and ends, PFE 73617. Construction of this model was described in an earlier post, at: http://modelingthesp.blogspot.com/2011/08/small-modeling-project-pfe-r-30-16.html . The second car, another reefer, was a steel car, PFE 48137. Construction of this car was also briefly described in a prior post (see it at: http://modelingthesp.blogspot.com/2013/09/a-classic-ho-scale-car-kit-one-more-time.html ). The third car was a stock car, SP 73557. The last car I will describe in the present post is a tank car, SP 58478, which has the lettering familiar for many years, with the “diamond S” emblem on the dome. I always emphasize that this diamond-S emblem only indicates that the car has been modified to be suitable for liquid sugar service, not that it necessarily is currently assigned to sugar service. But this model does show lettering indicating it is in sugar service at this time. I should mention that upgrading Athearn “Blue Box” kit cars like this into models of SP prototypes has been described in my blog (at this post: http://modelingthesp.blogspot.com/2011/05/modeling-sp-tank-cars.html ). I will stop at this point to keep this initial post reasonably short, and will continue with more of the train in the next post. The 22nd annual meeting known as Naperville (though held in recent years at a hotel a few hundred yards outside the Naperville town line in adjoining Lisle, Illinois) took place during October 22–25. 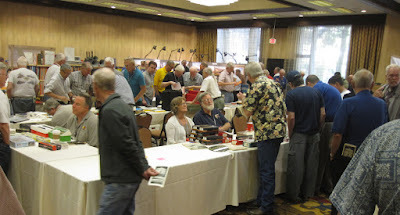 It was very similar in plan to previous meetings, with an extensive clinic program (four simultaneous talks during most time slots), a fair number of vendors, especially purveyors of photographs, and a large model display room which also hosted two very large layouts. There was some significant news announced at the event. This meeting was originated by Martin and Patricia Lofton of Sunshine Models in 1994, and continued to be run by Martin and Tricia in Naperville for 16 years, until 2009. The meeting had been so successful that it became known informally as the “Freight Car National” or sometimes the “RPM National.” Starting in 2010, the organizer and director of this meeting has been Joe D’elia of A-Line, but the change announced this year was a change for future years, to the supervision of Mike Skibbe and his friends at Modutrak. It is to be hoped that this venerable meeting, located conveniently to a very large population of model railroaders, can be continued and even made better in future years. As has been the case for several years, the meeting included a “Friends of the Freight Car” dinner. 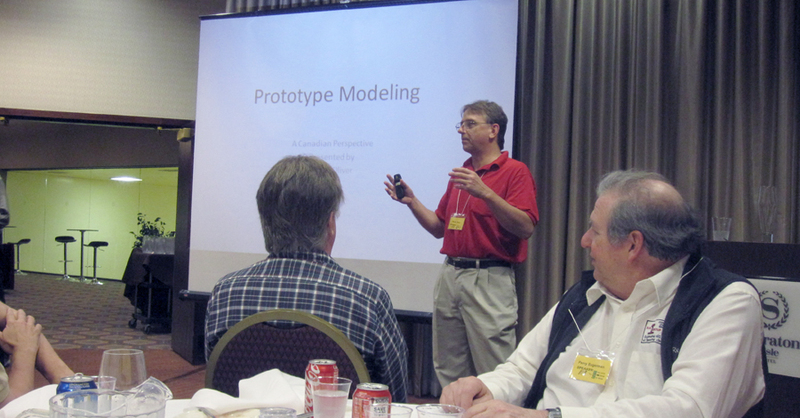 This year’s speaker was Pierre Oliver, who spoke on Friday about the Canadian side of prototype modeling. Here is Pierre, in the red shirt, beginning his talk. In the right foreground is Perry Sugarman. As always, there were a number of really outstanding clinics. I will not state all my favorites, but certainly one of the most interesting and dramatic was the one by Aaron Gjermundson on resin casting. Aaron had brought enough equipment to actually make some castings in real time! He had a variety of rubber molds, measured and mixed up some resin before our very eyes, poured it into molds, put the filled molds into a vacuum chamber to remove most air bubbles, and then into a pressure chamber to compress any remaining bubbles. These steps have been covered often in the hobby press, but to see it all done in a matter of minutes was indeed impressive. Shown below is Aaron, standing in the olive green shirt, and to the left of him is Joe D’elia, who was trying to help with a computer problem. Standing to the right in the black shirt is Mike Skibbe, also trying to fix the problem. But it didn’t get solved, and Aaron then met the challenge of describing what he was doing, without visual aids. It is always especially interesting to see models in the process of construction, since so much can be gleaned about the work being done. 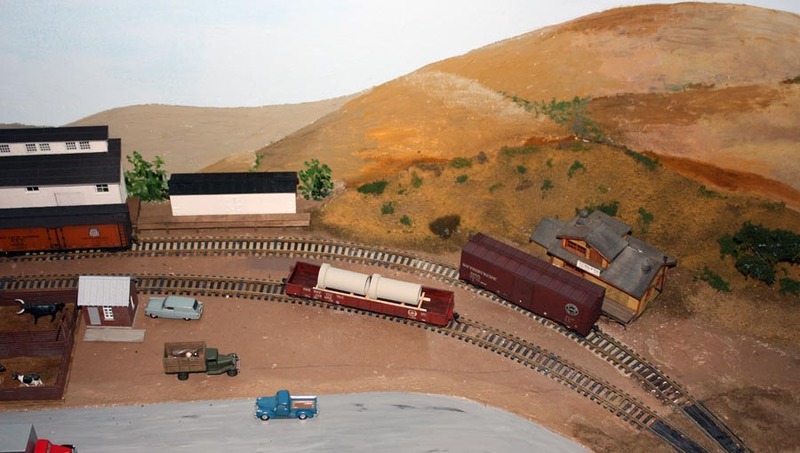 Here is one example, from an extensive display of HO scale tank cars by Steve Hile. It’s on its way to becoming a General American tank car. Also of interest was a new model of a CB&Q drop-bottom gondola, shown by Ed Rethwisch, as you see here. Lastly, I’ll show an overall view of the vendor room, which though somewhat more sparsely populated by sellers than in some years, nevertheless was busy between all clinic times and in the evening. 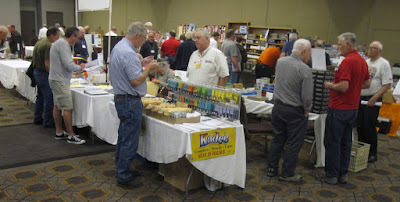 Nearest the camera is the Kadee Products table, with Sam Clarke standing behind the table. Sam brought a number of the new Kadee tank cars, which sold out quite quickly. The meeting seemed about typical of recent years (Joe D’elia reported about 250 registrants) and socially it seemed very congenial, with a lot of networking taking place in the hallways, vendor rooms, bar, and lobby. I look forward to learning what changes and improvements Mike Skibbe may be making for future meetings. I introduced the topic of my stock pen at East Shumala with some photos as well as information from the prototype, in Part 1 of this series (it is at this link: http://modelingthesp.blogspot.com/2015/03/a-stock-pen-for-east-shumala.html ). I then showed construction progress of the main pens that came in the AHM kit, and a tankhouse, in Part 2 (it can be found at: http://modelingthesp.blogspot.com/2015/06/the-east-shumala-stock-pen-part-2.html ). But there were a couple of parts of the project yet to be done when Part 2 was posted. The present post describes one of them, the office. To me, the missing element was an office structure that would look right. The brick building that was shown in Part 2, left over from another kit, really does not look right for a facility in the Far West. I decided to go ahead and make a suitable frame office from styrene. Looking at the site, and thinking about how much office space might be needed for a facility like this, I settled on an 8- x 18-foot building. Since it is an SP facility, I used shiplap or “novelty” siding, in this case Evergreen no. 4083. First step is to cut out all the sides, which I did by the usual method of scribe-and-snap. Next step was to choose the office door and windows. I chose the Grandt Line 30-inch door with a window (Grandt no. 5028), one of the Grandt double-hung windows (no. 5117), and a horizontal sliding window (no. 5081). Once these parts were laid out with pencil on the back of the wall pieces, I then cut out the window openings with a corner chisel (I showed the use of this tool earlier, at: http://modelingthesp.blogspot.com/2015/05/building-guadalupe-fruit-part-3.html ). Once the rough openings are cut, a flat Swiss file quickly cleans up the sides, with frequent checks against the fit of the Grandt parts. I really enjoy this part of a project like this, making the door and windows fit right. Next came painting. First, the building was assembled with 1/8-inch square styrene strips in each corner. Then I airbrushed the walls with Tru-Color no. 153 (Colonial Yellow), and painted the trim strips, door, and windows with a lightened version of Tru-Color no. 163 (Light Brown), since I think their color out of the bottle is distinctly darker than the SP color drift panel. Last, I airbrushed Tru-Color no. 154 (Moss Green) onto a piece of Pikestuff shingle sheet (part no. 1015) from Rix Products, for material to make the roof. Here are the components at this stage. Another feature I wanted to add, to make the building unmistakable, was a roof sign, of the kind visible in a number of SP photos. Here is an example, from an SP photo print marked “Fort Ord” (California) on the back. The sign is above the right end of the freight car. 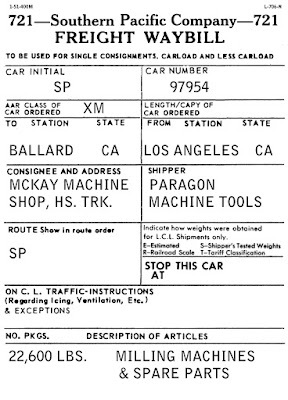 The end-door automobile car is UP 161089, Class A-50-14, built in 1937 with the then-standard Roman lettering, and still has its “NEW” weight stencil. The SP Consolidation, no. 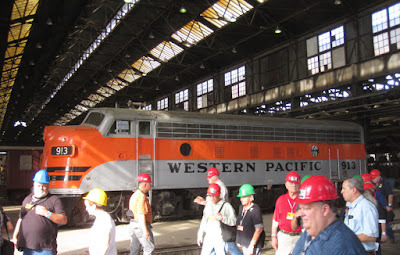 2838, is lettered “SOUTHERN PACIFIC LINES” on the tender, which is pre-1946 lettering. My conclusion is that this photo probably dates from 1938. Why? The car is moderately dirty, thus not brand new, but the date is before 1939, when the car would have been reweighed. Anyway, here is a closer view of the sign atop the freight station. The sign appears to have a dark, probably black frame. I used SP’s “Egyptian” font for this sign, as that was pretty standard for signage. I glued the printed sign onto 0.040-inch styrene sheet, framed it with black-painted scale 1 x 8-inch styrene strip, and glued it to the office roof with canopy cement. The sign looks a little larger than I expected, and I may replace it with something a little smaller. And the office needs a concrete front step. But for now it’s complete. Having a better looking office (and one which better fits the space) is a step forward for my stock pen (which SP called a “corral”). The only remaining task is to add a third pen to make the facility a little bigger, as I discussed in the first post in this series (link shown at the top of this post). Some folks reading the title of this post might think, “Why would we care about customers who are not rail-served?” (meaning, of course, on a model railroad layout). The answer is that they were actually quite important on the prototype. Many railroad lists of customers would show a considerable number with no siding, meaning of course that they had to work through a team track, freight house, or the freight section of a depot. Therefore these customers naturally offer a wonderful variety of possible load destinations and origins. Think of furniture stores, appliance stores, auto dealers, lumber yards, and a myriad of other retail establishments which might receive rail freight by unloading it directly from railcars, and conversely, of course, who might ship products out by the same means. This means that some of the open-top car loads you may have, such as lumber, creosoted poles, structural steel, or crates of machinery, can be destined to a team track. And of course almost any load in a box car can be delivered to a freight house or depot. Most railroads referred to the track serving the freight end of the depot as the “house track,” and that would be indicated on the waybill for such a load. Though we don’t usually bother to do so on model waybills, prototype waybills usually gave specific spotting instructions (such as “Building 6, track 2”), or team track, or house track. 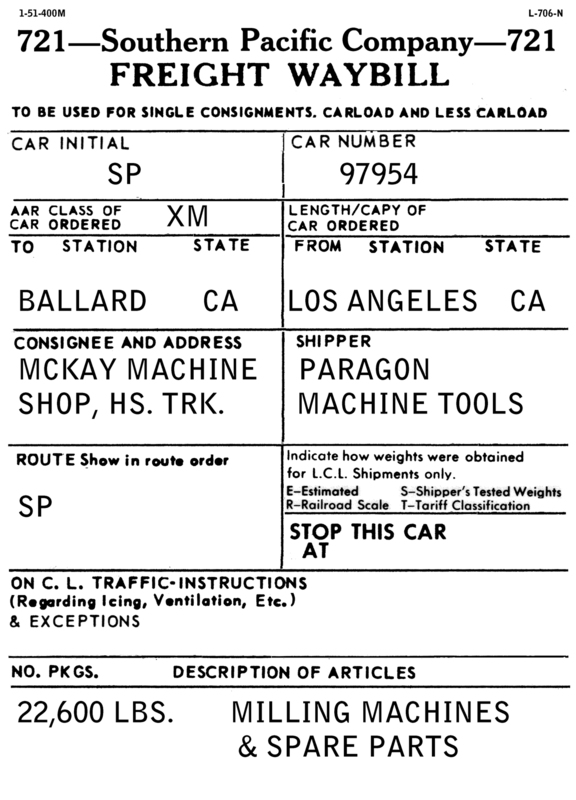 Here is the car identified in that waybill, at the Ballard depot. (The SP tried to keep its “Overnight” box cars in LCL service but did not always succeed.) One reason to ship to the house track instead of a team track is that there is a platform, which may help in unloading from the railcar, then transferring to a highway truck. The same kind of thing happens with team track destinations, and though I emphasized above that open-car loads are quite appropriate, the same is true of house cars, as in this example. Plywood could, of course, readily be unloaded to a flatbed or box truck from the box car. In a previous post, I showed an open-car load of concrete pipe in a PRR gondola, and its waybill, to illustrate that kind of example (at this link: http://modelingthesp.blogspot.com/2015/10/relocating-team-track.html ). Another example might be a delivery of lumber. 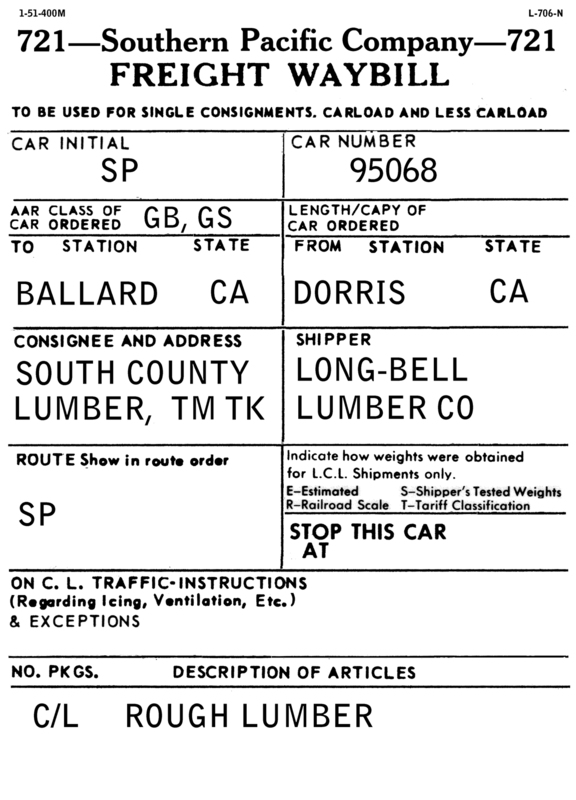 This commonly took place on flat cars or (for finished lumber) in box cars. But on the SP, it was not uncommon to ship rough lumber in gondolas. This is an example. I hope that these examples indicate the kinds of opportunities presented by house track and team track destinations for freight cars on a layout. They certainly are effective in offering variety on mine. A major announcement for SP modelers has just been issued by Dry Creek Models (via its proprietor, Robert Bowdidge). The models announced are the SP Class W-50-3 gondolas, originally Hart convertible gondolas, later converted into dump-only cars by SP. 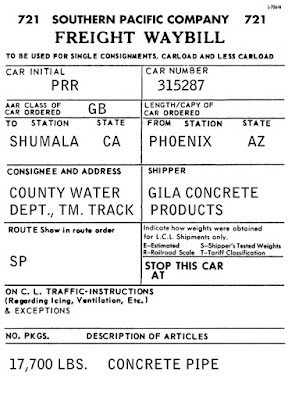 The original cars are described fairly thoroughly in Volume 1 (Gondolas and Stock Cars) in my series entitled Southern Pacific Freight Cars (Signature Press, 2002). To see more about Dry Creek, visit their web page at: http://www.drycreekmodels.com/ and for more about this specific model, there is a connected page with more photos and description; the link is: http://www.drycreekmodels.com/w-50-3-as-made.html . That page shows the model exterior well. Shown at left is the “open” body arrangement, for pulling a plow through and driving the cargo out through the side doors (note they are slightly open from their top hinges); center, arranged with dump doors closed and ends set to be a flat-bottom gondola; and right, dump doors open to rest against the sides and make a center-dumping car. The new kits can model any of these three. But by 1940, SP had disabled the side doors, making these into primarily dump cars in their later life. As background, I have previously mentioned Robert’s fascinating display of his 3-D printing process which produces these models as one-piece bodies. There is an overview of the display for Bay Area Prototype :Modelers (held last June) at this link: http://modelingthesp.blogspot.com/2015/06/bay-area-prototype-modelers-2015.html . Robert again brought some of his models, including flat cars and battleships, together with explanatory photos, to the SPH&TS meeting described in my previous post (you can read it at: http://modelingthesp.blogspot.com/2015/10/sph-meet-2015.html ), though in that post I did not allude to the display. A photo of it is below. The photos at lower left show the processing in the 3-D printer, and at right center is an unpainted car body. I realize that even clicking on this image to enlarge it will not help much, but I wanted to remind those who saw the display that the models are now available. These are very impressive bodies. I show below one of each kind of body offered in the Dry Creek kits, the gondola with flat floor, and the dump car. The kit, by the way, comes with very clear and complete directions for the steps needed to complete the model. Not shown are the end pieces, which can be installed in the position desired (see prototype photo at top). The most impressive part of this model, probably, is the underbody, with the truss underframe correctly well back behind the side sills (unlike the Train Miniature model) and also prototypically dimensioned (unlike either the Silver Streak or Train Miniature models, the trusses of which are considerably oversize). I am eager to add the few necessary details, like grab irons, sill steps, and brake cylinder, along with trucks and couplers, and put these beauties to work on my layout. Kudos to Robert Bowdidge for having the vision to realize they could be made by 3-D printing, and for having the persistence to work through all the development work to bring these to market. I suspect many SP modelers will want one or several of these superb models. A highlight for many was the time at CSRM, especially a chance to have a guided tour through the SP Sacramento Shops buildings. It’s remarkable to stand on the east side of the Erecting Shop, the part built in 1869, and realize what an enormous number of SP locomotives has passed through that building in its history, from diamond-stack wood burners, through cab-forwards and F-units, to the most modern SD40 rebuilds. 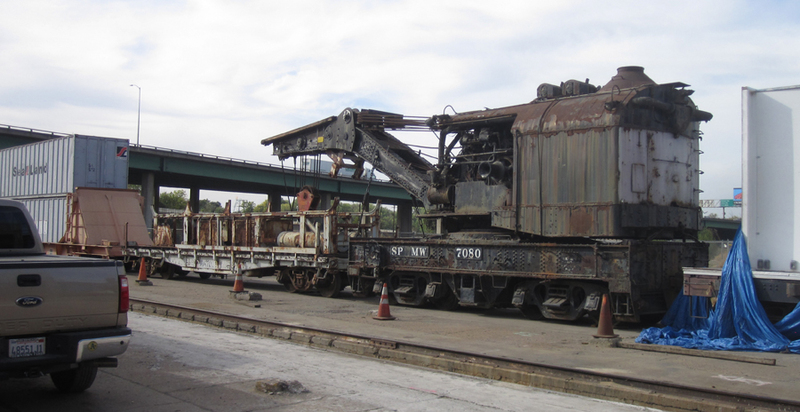 Today CSRM has both work equipment and stored artifacts in the building, such as the handsome locomotive shown below, and not too far into the future, this will become one of the Museum’s own buildings. Also seen around the Shops area are some pieces of equipment stored outside, such as this 120-ton crane, and beyond it, the original SP experimental double-stack container car. That’s the I-5 freeway bridge in the background. 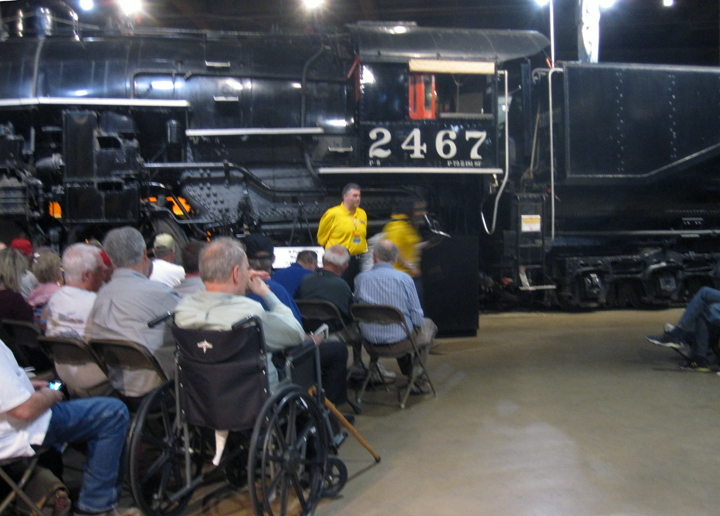 In the evening, former Southern Pacific President Mike Mohan spoke to the attendees, seated in the museum’s roundhouse, with the dramatic backdrop of SP Pacific 2467. In this photo, convention co-chair Scott Inman (yellow shirt) is at the podium to introduce Mr. Mohan. Back at the hotel, we had a full schedule of events. The model contest and display, along with the photo contest, was very strong this year, with numerous entries of very high quality. I entered a freight train, and as it happened, it was voted the First Place entry in this category. In the photo below, it’s the second one from the front, pulled by a steam locomotive. This is a 15-car train with a range of both SP and non-SP cars in it. One of the attendees in the room asked if I would show the cars in the train in a blog post, and I will consider doing so, when I can get all the cars photographed. An always-busy part of these meeting is the vendor room at the hotel, where a wide range of sellers of both prototype and model materials have items for sale. Here is just an overall view of the room on one of the afternoons. I always enjoy the SPH&TS annual meets, because of course the subject matter is dear to my heart, but I would rank this one as one of the very best I can remember. In my previous post on this topic (at: http://modelingthesp.blogspot.com/2015/09/jupiter-pump-and-compressor.html ), I showed the site for this industry and said a little about its traffic, along with preliminary work on an old Suydam kit structure to be used as a receiving building. To signify a larger plant than what can be built on the layout itself, I added a KingMill Enterprises flat behind the Suydam building, as I showed in the prior post, and decided to add also a one-story extension of the plant to the right. This extension is a concrete block building, including in the KingMill “Jefferson St.” sheet no. 9. (As I mentioned in the previous post, KingMill is no longer selling these sheets, which may have been sold to Scenic Express.) Trackage into the receiving building obviously is not yet complete. The photo below shows the industry as it was switched in the last operating session (see: http://modelingthesp.blogspot.com/2015/10/another-operating-session.html ). Attached above the building extension you will see the signage for Jupiter. In choosing a logo for my sign, I ended up with the following image, which perhaps will remind some of the logo of a fine brew pub here in Berkeley called the Jupiter. It has been and is an excellent pub for local beer and food, but as far as I know, they have never built any pumps or compressors. This adaptation of their logo should serve well to announce this industry on the layout. Here is a closer view of that image. By the way, if you were curious, yes, that is a “red spot” behind the name.It’s even about the right shape, as you will see if you Google "Great Red Spot,” though I suppose a critic might say that the spot on the logo is only a pretty good red spot. What remains to be done on my representation of this industry? I may add an additional building flat to the right of what you see in the photo at the top of this post, and some additional details need to be added around the area, and of course the receiving trackage needs to be completed, along with a switch machine for the turnout. And the lead track off the main crosses Oso Flaco Creek (for more on the construction of this creek, see for example: http://modelingthesp.blogspot.com/2015/03/modeling-oso-flaco-creek-part-2.html ), and a short beam bridge will be added there. But for now, cars can be picked up and delivered from the lead track which exists. Inbound components to Jupiter include not only raw materials for the foundry and fabrication shop, but all the other parts which go into these products, from gaskets and valves and screw-machine products, to electric motors, gear trains, and electrical controls. There is a craneway inside the receiving building, so that open-car loads such as steel plate can be unloaded and moved into the warehouse. There is also a dump between the rails for bulk cargoes like coal. Though coke is an efficient fuel for remelting, as would be done at Jupiter, it is also more costly, and many small foundries continued to use coal. My schematic map for Jupiter will direct bulk and open-top loads onto the outer track, Track 2, while house car loads both inbound and outbound will work from Track 1, nearest the warehouse. Waybills are being developed and a schedule is being created (a schedule for car flow into and out of the plant — as I’ve discussed elsewhere on this blog: http://modelingthesp.blogspot.com/2011/11/operations-demand-based-car-flow-2.html ) for Jupiter operations. I’m looking forward to including these shipments as part of operating sessions at Ballard. From time to time, I am able to create an additional freight car I need by simply adding new decals to an existing or new model. Provided that a commercial model exists for the desired freight car, such work can be typical of what I call a “small modeling project.” An example of this, related to the present project, was the creation of a General Chemical tank car, which was described in an earlier “small project” post (you can see that post at: http://modelingthesp.blogspot.com/2012/10/small-modeling-project-icc-104-tank-car.html ). Rather than directing you there for the background, however, I will summarize it here. Among the larger chemical companies in the United States in the 1950s was Allied Chemical & Dye Corporation. This company had been formed in 1920 by combining five existing companies: General Chemical Corporation, and the Semet-Solvay, Barrett, Solvay Process, and National Aniline & Chemical companies. 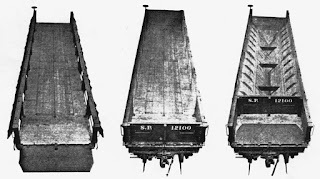 All five continued to operate under their own names though owned by Allied, and those with existing freight car reporting marks continued to use them. In the early 1950s, Allied began to place its emblem on the freight cars of the five companies, including General, and in 1958 the entity would be renamed Allied Chemical Corporation, and at that time submerging the various corporate subsidiaries into a single operation. 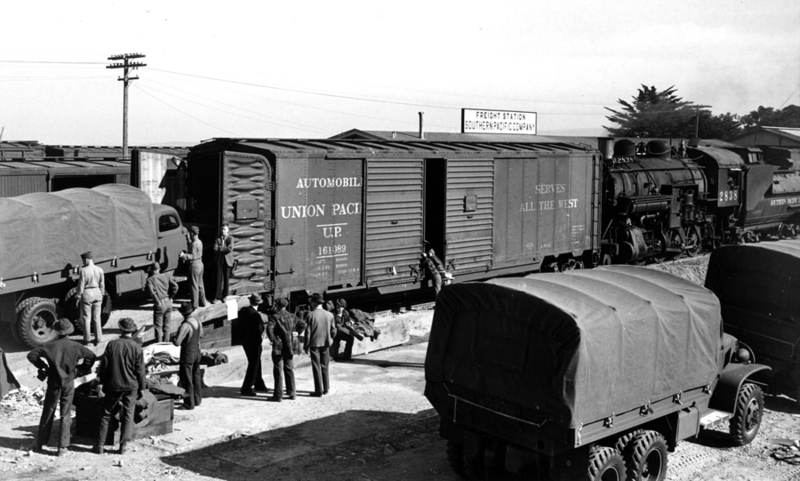 However, even then, the separate divisions continued to roster their own freight cars under existing reporting marks. Most of the General Chemical car fleet in 1953 was tank cars, but they did roster a small number of 1958-cubic foot covered hoppers for the shipment of dry commodities. This size of covered hopper is exactly what InterMountain has produced in their square-hatch covered hopper model, which brings me to the present project. I purchased one of these cars in typical gray paint, and covered the reporting marks and car number of the manufactured car with the same color. I was then ready to re-letter the model. The most visible and thus critical part of this lettering scheme is the Allied Chemical logo. I don’t know of one of suitable size in HO scale, but there is a Microscale N-scale set, no. 60-410, which contains such an emblem. 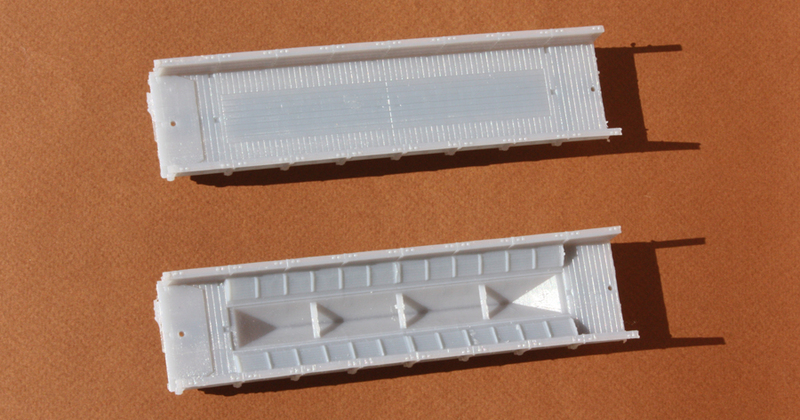 (The corresponding HO scale set, 87-410, is intended for large ACF Center-Flow covered hoppers, and accordingly has a rather large Allied emblem.) Any of a number of alphabet decal sets could be used for reporting marks and numbers; I happened to have handy a Microscale set, no. 87-69-2, in black lettering, which includes 7-inch characters. The eight prototype cars were numbered 10000–10007. If nothing else, this reminds us that sometimes another scale may provide what we need, in this case decals. I have also used O scale decals in some projects. I have not located a photo of one of the General Chemical covered hoppers, but given that in later years, several different sizes of covered hoppers assigned to Allied looked like the scheme I made, I think it is at least credible. At some point, General Chemical (and Allied) changed from Roman to Gothic or sans-serif lettering, but I believe it was later than my modeling period of 1953. I now have an additional freight car to deliver dry chemicals to my chemical processing industry in Ballard on my layout. This helps with variety in operating sessions. Team tracks are close to being “universal industries,” in that practically anything can be sent to, or shipped from, a team track. Even bulk cargoes can be loaded or unloaded with suitable equipment, and the same is true of liquids in tank cars. Because of this universality, I have a team track at each of my layout towns, Shumala, Ballard and Santa Rosalia, and in most operating sessions they are all switched. Naturally this location has continued to be called the team track, even though Coastal Citrus is moving to Santa Rosalia on the coast, and a new industry, the Associated Oil dealer, was put in its place. But as it happened, Associated took up quite a bit more space than the Coastal Citrus building. In particular, it intruded into the team track space, because it extended farther to the right than the Coastal building in the photo above. Here is an overall view of the current area. The problem here is that there is barely space even for a 40-foot car (the one shown, a Speedwitch kit for an SP gondola, is 50 feet long), and more seriously in my view, someone not familiar with the layout would not even realize that this cramped space was a team track. I began to look for an alternative arrangement. An option might be to compress the space used by the Associated dealership, But once I determined that the Associated structures could not be placed much closer together than they already are, I realized something else would have to happen. I then remembered a bit of a blank space next to my stock pen at East Shumala, which is shown in the photo below. The truck parked just off Pismo Dunes Road (the gray area) at lower left center shows how far the under-construction additional stock pen will extend. The crossing of Roundhouse Street over the tracks is at lower right. The area to the right of the cattle truck has plenty of space for team track operation, is right off a public road, and readily accommodates longer cars. 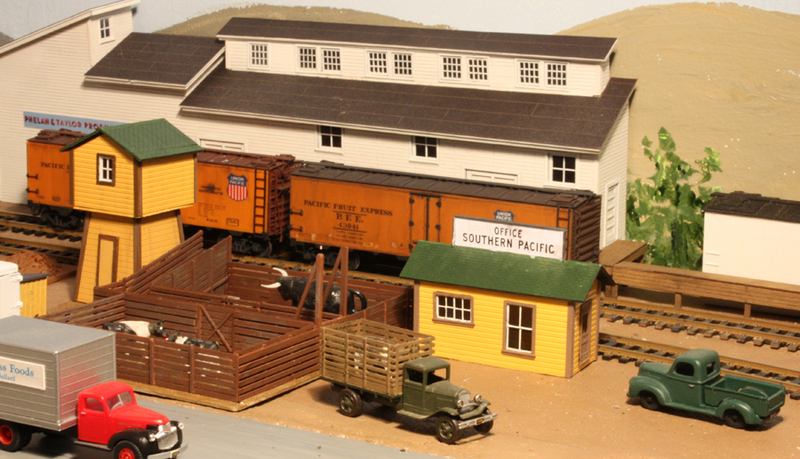 And it adjoins the stock pen, also owned and operated by Southern Pacific, so a single office can serve both. 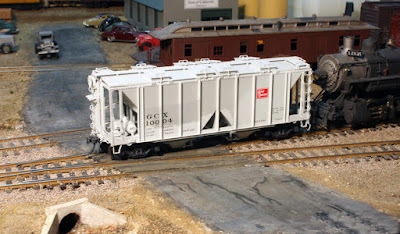 Shown alongside the chosen location is a Westerfield Pennsylvania G22 gondola (you can read my post about it at: http://modelingthesp.blogspot.com/2015/09/another-signature-car-part-2.html ), with a load of concrete pipe; this is a Duha load from JWD Premium Products. To illustrate the kind of waybills associated with this track, here is a bill for that gondola shown above. The new location is much better for team track use than the location previously identified, and to make it happen, all I needed to do was modify the schematic track maps for Shumala and East Shumala so that crews will know where it is. My maps are digital, thus easily changed, a feature I mentioned in an earlier blog post about my town maps (you can read it at: http://modelingthesp.blogspot.com/2014/10/my-column-on-timetable-construction.html ). And even better, waybills can stay the same, since the new location is still in Shumala yard limits. I’m much happier with the new team track, and am sure it will work better for layout operation. If you are a tank car enthusiast, as I am, or if you just want to have a few realistic loads in the tank cars you operate, obviously you need to know something about what is carried in different sizes and ownerships of tank cars. Now petroleum products are easy, because much of that traffic moved in oil company tank cars (and UTLX cars serving the former parts of Standard Oil). But chemicals are another matter. What was in which cars, and where did they originate? In my own case, I am interested in these questions as part of the process of compiling waybills, from prototype lists of shippers and receivers whenever possible, through prototype research otherwise. 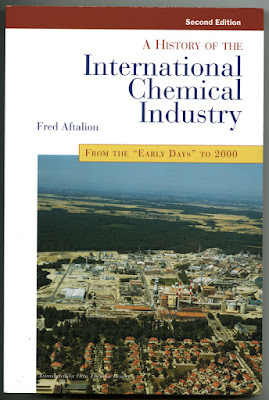 I have often found myself using Google, first to find a correct company name for my 1953 modeling year (like all corporations, chemical companies merge or split or are renamed from time to time), then further researching to find out where the company had its production plants or refineries, then to find out the principal products of that company and plant. Sometimes I start at the other end, knowing what one of my on-line industries would need to receive, then searching to find out where that product might come from. Some of this process has been alluded to in previous posts (for example, http://modelingthesp.blogspot.com/2011/09/content-of-waybills.html , and also the follow-up to that post, at: http://modelingthesp.blogspot.com/2011/10/content-of-waybills-2.html ). But those posts, from back in 2011, were aimed at the more general question of waybills for all kinds of cargo. The present post is aimed specifically at tank cars and their cargoes. I cannot say enough about this book. Phenomenally rich in information, at just the right level of detail for tank car cargoes and car choices, and worth way more to me than the $24.95 price. It does contain extensive information about European companies too, but the U.S. information, including oil companies, is just excellent. 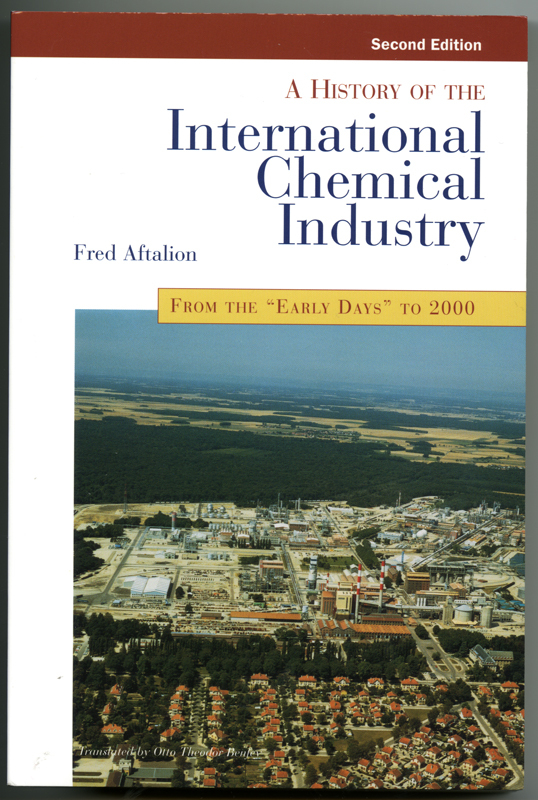 From this book, I could much more quickly and conveniently discovered the history of Allied Chemical, which I laboriously teased out from several sources (my findings are here: http://modelingthesp.blogspot.com/2012/10/small-modeling-project-icc-104-tank-car.html ). And that’s just one example. How do you connect the company and product information to tank cars? It is very helpful to have at hand Ed Kaminski’s two books (published by Signature Press), American Car & Foundry Company, 1899–1999, with a long chapter on tank cars but unfortunately now out of print, and Tank Cars of American Car & Foundry Company, 1865–1955, published in 2003. These two books contain a great many builder photos. 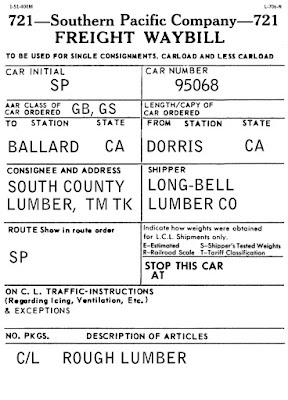 The second one, Tank Cars, also contains a multi-page table in the back of the book, showing which cargoes could be carried in which cars. The symbols in this table are in the key below. To choose two examples, common chemicals such as nitric acid and napthalene are in the table portion shown, and their status identified. Napthalene is listed as “N.R.,” meaning non-regulated, and thus can move in the simplest kinds of cars, even the non-ICC-regulated cars such as AAR 203W, and without any placard. 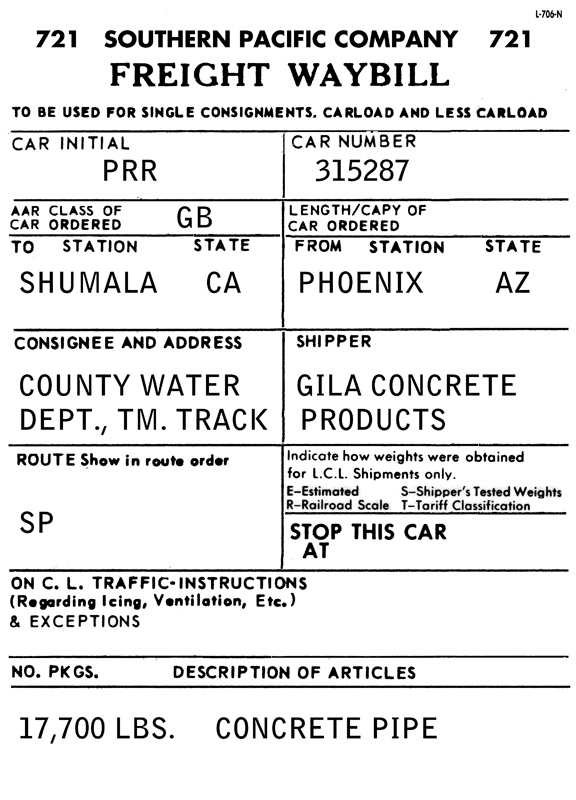 The complete table is thus a handy way to match up tank car types with waybilled cargoes and with the appropriate placards for those cargoes. 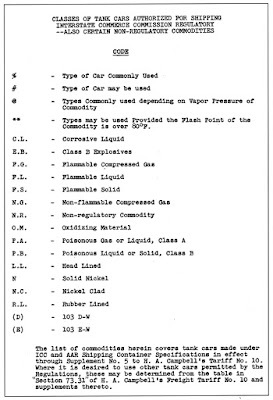 I’ve discussed tank car placard use before, both model and prototype (see: http://modelingthesp.blogspot.com/2012/03/tank-car-placards-modeling.html ), and also gave in that post an introductory discussion of use of the table material shown above. It’s also worth mentioning that there was some seasonality in tank car cargoes in the 1950s. We naturally expect seasonality in things like produce harvest (see for example my post on this topic, which can be found at: http://modelingthesp.blogspot.com/2015/09/seasonality-of-crops-and-traffic.html ), but the same applies, in a lesser degree to tank cars. For example, asphalt for road repair moved much more heavily in late spring and summer than the rest of the year; home heating oil was very heavy in fall, as was LPG, as homeowners prepare for winter. Gasoline is heavier in the warmer months, and so on. 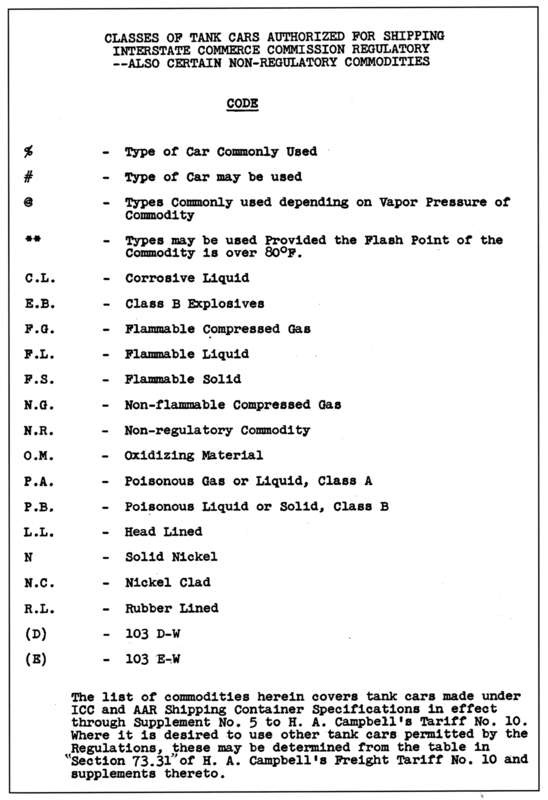 To illustrate, here are data from 1948, by quarter, taken from Table N in the publication The Tank Car Story, Defense Transportation Administration, Washington, DC, November 1, 1951. This publication presents a study of tank car availability with respect to military needs during the Korean war. You can readily see that asphalt and gasoline are quite seasonal, in contrast to soybean oil, deliberately chosen as a nearly non-seasonal commodity for comparison, while cottonseed oil does show seasonal variation in parallel with cotton harvest season. 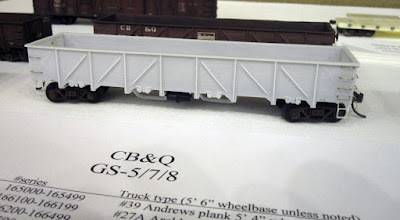 In creating and using tank car waybills on my layout, I have taken advantage of the kinds of information shown in this post. I commend these sources to anyone interested in doing the same. This last weekend I hosted another pair of operating sessions, one Saturday and one Sunday, in the usual mode on this layout, of two two-person crews, one working each side of the layout, then switching to operate the opposite side in the second half of the session. These sessions were not particularly different from previous ones, except for a couple of changes I made to see how they would work out. 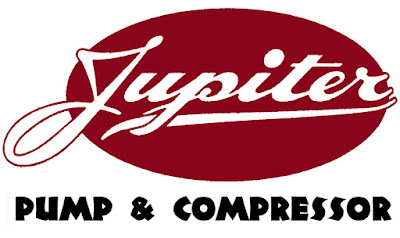 One new feature was the inclusion of switching at Jupiter Pump and Compressor in Ballard (an industry described in an earlier post, at: http://modelingthesp.blogspot.com/2015/09/jupiter-pump-and-compressor.html ). I included both inbound and outbound car movements, which seemed to work fine, even though, as shown in the post just cited, the actual loading and unloading spot tracks are not installed yet. The cars were moved to and from the plant lead only. I also included some off-spot moves (cars not spotted at their final destinations, but instead left on nearby tracks by the previous switch crew), to see how these would work. These moves also worked pretty well. In this photo of conductor Robert Bowdidge (right) and behind him, Jim Radkey, you can see a crew involved in one of those moves at Ballard. 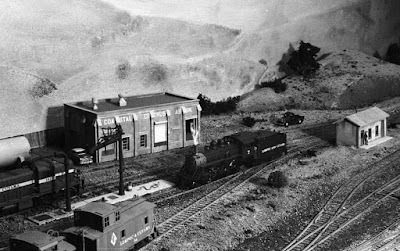 The view above is over the hill at the end of the peninsula on the layout, so at left is visible the backdrop and back edge of Shumala, but the two crew pictured are working at Ballard. On the side of the layout at Shumala, I changed around the switching moves from what had been done before, and these too went smoothly, as far as I could tell. Here you see conductor Otis McGee (left) and Larry Altbaum working through their switching on Sunday. The last change I would mention for my operating scheme was that I included a confiscation, in which an empty car at one industry was to be spotted at a different industry for loading, something familiar on the prototype. This is not a complex concept, but I wanted to be sure my paperwork describing the moves would work. Here Ed Slintak, right, and conductor Mark Schutzer are working Ballard. The yellow NP reefer just under Ed’s elbow is the confiscated empty they moved. This session went well and completed the variations in operating patterns that I had wanted to try. I have since thought of a few more changes to try in future sessions, and part of the planning has been to balance the work load on each side of the layout, so that both crews finish their first set of switching at similar times, and can then switch sides. But of course the rate of work by any crew depends on the level of experience they have, as well as on the degree of familiarity with the layout. Most of the crews who have worked on the layout this year were new to it, and when people return for additional sessions, I am sure their rate of work will be higher. One of the visiting operators was heard to say, “Gee, there really can be a lot of switching on a small layout,” and to me that was a compliment — exactly what I have been hoping to accomplish.